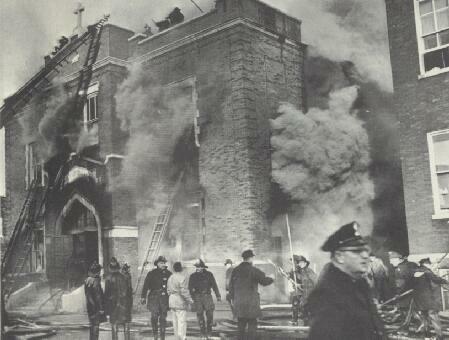 On the 1st of December, 1958, Chicago was the scene of another catastrophic fire. This disaster occurred at Our Lady of the Angels School. Historical footage from the U.S. National Archives depicts the event which claimed the lives of 92 children and three nuns. Nearly 100 additional children were injured. Thanks to the selfless efforts of firemen, teachers, school officials and total strangers, about 1,000 lives were saved. What may have caused the fire - still never "officially explained" - is discussed in a book entitled To Sleep with the Angels (by David Cowan and John Kuenster). It is not an easy read. Fire inspectors believed the school disaster may have started in a thirty-gallon drum containing waste paper, located near the bottom of a set of stairs. Arson was suspected, but no one was ever charged. The fire was most intense in the second-floor hallway. What made this location even more devastating is that it was the only escape route - other than second-story windows - for five of six impacted classrooms. The tragedy occurred a short time before the students would have been dismissed for the afternoon. Some parents learned what was happening when they arrived at the school, expecting to pick-up their children at the end of a normal day. Children who were involved in this tragedy were very young. Many were at the age where they had not-yet developed their own coping skills. 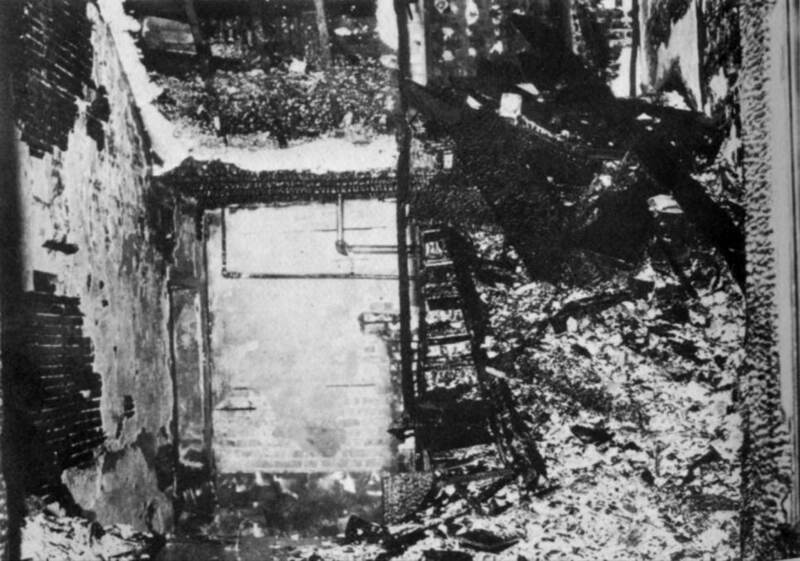 Most of the children who survived got out of the burning building through the second-story windows. Not all of the ladders were high-enough, however, to reach the only-available exit points. Tribute to the victims of the fire by Trocaria, copyright Light of the Midnight Sea Productions, all rights reserved. Online, courtesy YouTube. Clip provided here as fair use for educational purposes and to acquaint new viewers with the production. Bos, Carole "Chicago Fire - Our Lady of the Angels" AwesomeStories.com. Oct 10, 2013. Apr 23, 2019.